Srisailam is a celebrated hill town set on a lofty natural setting on the banks of the River Krishna, in Kurnool district of Andhra Pradesh. Srisailam is identified with its many ancient temples including a Jyotirlinga, a wildlife sanctuary and a dam. Srisailam hills are very canorous in scenic attractions with mind-boggling wildlife. Sirsailam is a must visit if you are looking for a vacation which is peaceful, quiet and where the calmness can refresh your senses. You could seek the blessings of the almighty by visiting the many majestic temples in the city such as the one dedicated to Lord Shiva (it is renowned as Sikhareswara Swamy temple) or the famous Bhramaramba Mallikarjunaswamy Temple which is located at a height of around 457m from sea level. The Nallamala forest ranges with densely arboraceous trees and multifarious flora and fauna lie in close proximity to the Srisailam hills. On the southern bank of River Krishna, is a temple, the town Srisailam is known for. The Mallikarjuna Swamy Temple, is the most celebrated temple of the town and finds it roots 6 centuries in history, when it was built by King Harihara Raya of Vijayanagar. According to the legend that the temple houses, Goddess Parvati cursed sage Bringi to stand, as he only worshipped Lord Shiva. Lord Shiva, after consoling the goddess, gave him a third leg, so that he could stand more comfortably. Find the idol of sage Bringi standing on three legs here as well as idols of Nandi, Sahasralinga and Nataraja. The walls and pillars of the temples are also adorned by beautiful carvings and sculptures. One of the most beautiful temples of the town, this is the one sacred structure, located on the Nallamala hills, that one should not miss while here. The total area of this tiger reserve is 3568 acres, making it one of the largest tiger reserves in India. Srisailam Dam and Nagarjunasagar Dam are also located in the reserve area. Apart from the Tiger, one can spot here, leopards, sloth bears, dhol, Indian Pangolin, Chital, Sambar deer, Chevrotain, Blackbuck, Chinkara, and Chowsingha. There are other reptiles and amphibians also found in this area including crocodile, Indian Python, Kind Cobra and Indian peafowl. One also finds a number of crocodiles in the down waters of Srisailam Dam, where a breeding programme, supported by the local government is being carried out. The virgin setting of Akkamahadevi caves around 10 kilometres away from Srisailam in Telangana is a natural wonder. Located right across the perennial Krishna river, the caves are a natural formation that has been in existence for more than a million years. The caves are located amidst the Eastern Ghats which stretches for vast sections of Andhra Pradesh and Telangana. With its naturally formed arch at the entrance which stands without any support of any kind, the caves portray an imposing image on the viewer's eyes. Although the main attraction is the deep-lying Shivalinga inside the extensive maze of pathways, it also is an adventurer's abode. The lingam is a popular religious shrine, dedicated to Lord Shiva and has attracted tourists and pilgrims for centuries. The hills of the Nallamala range across the ghat section are a sight to behold, offering serene, picturesque views of the vista around, en route the Akkamahadevi Caves. The Krishna river is the sole route available to access the caves, and the small but scenic journey is said to be well worth the effort. 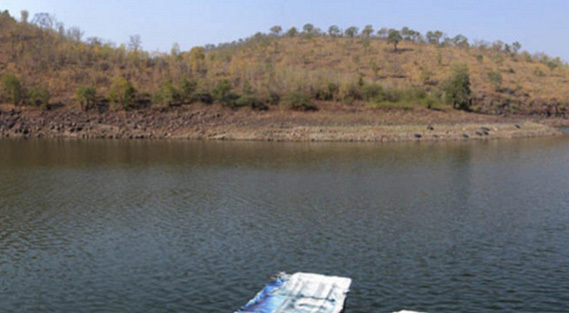 Private and public boat operators undertake these short trips from the small piece of habited land, close to Srisailam. Bordered by the towering Nallamala hills on all sides, the pristine Krishna river offers a calm ride which may last up to an hour or so. There are numerous rock-cut natural cave formations in and around the region, but Akkamahadevi Caves is the fascinating sight of them all. One of the main centres of attraction for the town, the Srisailam Dam in Telangana is also one of the 12 largest hydroelectric projects in India. A blend of uninterrupted natural beauty and engineering genius, the Srisailam Dam emerges out of the verdant greenery of the Nallamala Hills to mark its presence. It is built across unrelenting verve of the Krishna river and is nestled in a deep canyon, surrounded by forests and sceneries, finding a home in the sound of gushing and falling water. The road up to the dam is a scenic beauty too, and the view of the Srisailam Dam is a humbling sight to behold. One of the best things to do around the site of the Srisailam dam is to spend some quality time with your friends and family as you look over to the gurgling waters of River Krishna. The view from the top of the dam is an astonishing sight, especially when the water is released and you can see the might of its flow right in front of your eyes. Owing to its natural charms, it is a delightful destination for nature enthusiasts and photography lovers as well. A weekend picnic to this attraction is an instant fix from the stress of face-paced city life. On the banks of River Krishna, over the Nallamala hills is the Bhramaramba Devi Temple, dedicated to Goddess Parvati. The complex is inside the Mallikarjuna Swamy temple itself. Bhramaramba literally translates into 'Mother of bees', and is a form of Goddess Parvati, who took the form of a bee to worship Lord Shiva in one of his forms, Mallikarjuna. The temple is also one of the Shakti Peeths of India and finds itself immersed in immense festivity and a huge crowd of devotees on the occasion of Maha Shivaratri. At the highest point of Srisailam, referred to as Sikharam, one finds a temple dedicated to Sikhareswara Swamy, watching over the landscapes and a pristine River Krishna flowing below. Sikhareswara Swamy, is one of the forms of Lord Shiva, and is believed to possess the power to free his devotees from their sins. Amongst this abode of the Lord of Sikharam and the some of the most beautiful views in the area, there is another temple, dedicated to Lord Ganesha. Visit the temple, for breathtaking sceneries, views and hills, all wrapped around in a wisp of spirituality and devotion. The devotion towards Lord Shiva, that Srisailam is known for, finds its way to the banks of Krishna River as well. A rocky bank of this river has each of its rocks, believed to be an image of Lord Shiva. The belief also grants the bank its name, 'Lingala Gattu'. A recent addition to the temples of Srisailam is the Hemareddy Mallamma Temple, located close to the Mallikarjuna Swamy Temple. The temple also has an ashram neighboring it. With intriguing stories and legends, the temple is a fascinating experience offered by Srisailam. The Sakshi Ganapati Temple has been beautifully located at the hill town of Srisailam. It's placed amongst the backdrop of picturesque natural settings and enshrines a black idol of Lord Ganesha. Being the most loved Ganapati temple in Srisailam, all pilgrims generally tend to start their visit to Srisailam from Sakshi Ganapati temple. There is a modest climb of 10 steps to reach the sanctum of this temple. The most alluring part about the temple is its location. The temple nestles amongst dense woods. The surroundings are calm and the environment almost enchanting. The area is also clean and quiet pristine, making it suitable for praying and meditation. For those who are looking for a unique experience then Chenchu Lakshmi Tribal Museum is the place for them to visit. This tribal museum is located near the entrance to Srisailam town. This museum presents a glimpse into the lives of various indigenous tribes who are residing in the Srisailam forests. This museum has been after Chenchu Lakshmi, consort of Narasimha Swamy. Statue of Chenchu Lakshmi can also be seen at the museum. Here at the museum, one can get a better understanding of the lives of these tribes, their practices and culture. One of the prominent tribes in the Nallamala Hills is Chenchus. Nallamala forest has been the residing abode of these tribes with close to no contact with the outside world. However, after the construction of the concrete road by the government, sometimes members of these tribes can be seen interacting with tourists. This tribal museum has two floors; each floor displaying a wide array of artifacts related to various tribes. Some of the objects displayed at the museum include Idols of Gods, weapons, objects of daily use, musical instruments and many more. In the vicinity of the museum, there is also a park which is dotted with images of dinosaurs, tribal huts, etc. There is also children play area inside the museum complex. Visitors can also buy locally collected honey at the shop in museum. The honey sold here is collected by the members of tribes and is sold by the state government. Located on the foothills of Nallamala Hills, Srisailam, Hathakesvara Temple holds a significant position among devotees. Anyone who comes for a Srisailam tour pays a visit to this ancient temple as well. This temple is dedicated to Lord Shiva. A mystical Shiva lingam has been enshrined in the temple. Although smaller in structure, Hathakesvara Temple presents beautiful architecture. This temple is consisted of an open Mukha-mandapa with many pillars and a Garbhagriha. It attracts devotees from everywhere with its significant history. One of the major attractions of Hathakesvara Temple is the belief that by visiting this temple and seeking blessing of the Sri Hatakeswara Swamy, a form of Lord Shiva, devotees can get rid of various diseases. The Shiva Lingam is said to hold exceptional powers to cure devotees of various kinds of illnesses. Another attractive feature of Hatakeswara Swamy Temple is the breathtaking view of the surrounding hills and the river that one gets from here. As per the legend behind the temple, there lived a potter who was an ardent devotee of Lord Shiva. He used to give his food to the pilgrims. To test him, once Lord Shiva appeared in the guise of pilgrim and asked him food. Unfortunately there was no food in his hut so he prayed to Lord to show him a solution. Pleased with his devotion, Lord Shiva appeared in a pot. This gave the name of the temple as Atikeswaram which later became as Hatakeswaram. A visit to this temple is believed to cure devotee of various diseases. Srisailam a well known pilgrimage town located about 232 km from Hyderabad in Andhra Pradesh houses so many popular tourist destinations. Mallela Theertham is a wonderful waterfall situated close to Srisailam. This fall is about 58 km from Srisailam. This fall located amidst the cool dense forest of Nallamala is a perfect getaway from the crowd and pollution of city life. The second longest river in the country, River Krishna, flows through this forest. To reach this waterfall situated in the middle of dense forest one has to take 350 steps down. For those interested in adventure tourism and wildlife this is a perfect spot. A walk through the forest enjoying the lush greenery of nature and clean fresh air is a refreshing experience. This serene fall totally worth the effort. One of the advantage of this fall is that one can go underneath and enjoy the cool water in the Mallela Theertham. The water in this fall is believed to be holy water. The belief is that many sages performed penances in this fall for Lord Siva and himself appeared before many devotees. The water comes from a small rivulet flows through the forest to meet River Krishna. The perfect time to visit this falls are from October to February. During this time happens the best flow. It is believed that the water of this waterfall is holy as many saints have performed penances here. Pleased with their dedicated prayers, Lord Shiva is also said to have appeared in front of many saints at this place. Paladhara Panchadara is another popular place to visit in Srisailam. Located at distance of around 4 km from Srisailam presents breathtaking scenic beauty. Along with mesmerizing beauty, these natural streams also have religious association. The name of the stream is derived from Lord Shiva. The name Paladhara stands for the stream originating from the forehead of Lord Shiva, as pahal means forehead and dhara means stream. The name Panchadhara signifies the five aspects of Lord Shiva (Pancha means five and dharma means stream). Paladhara Panchadhara has been described in holy Hindu texts Puranas as well. Ancient text Skanda Purana describes the flow of the stream as Bhogavathi, which later joins the River Krishna. As per legends, it at this place where Sri Adi Shankaracharya had stayed here doing meditation before he started his journey in the 8th century. It is said that it was during this period that he has created renowned masterpiece Sivanandalahari where he had praised Lord Mallikarjuna in its verses. Sri Adi Shankaracharya has also written about Goddess Bhramaramba and praised her in another creation Bhramaramba Ashtaka. Owing to this, Statues of Sarada Devi and Sri Adi Shankaracharya have been built here. Located at a distance of 20 km from Srisailam, Ista Kameswari Temple stands beautifully amid the lush greenery of forest and refreshing atmosphere. This ancient temple is visited not only by devotees but also by architecture and history enthusiasts. It is located inside a cave, which further adds to its enthralling charm. Dedicated to Goddess Ishtakameshwari, which is a name for Goddess Parvati, this temple dates back to 8th to 10th century. However, the exact time of its construction is not clear. It is believed that a darshan of Devi at this temple can fulfill devotees’ wishes. The most striking feature of this temple is the idol of Goddess Ista Kameshwari Devi. The forehead of the Goddess is as soft as a human skin in spite of the fact that idol is made up of stone. Once at the temple, after the darshan and pooja, the temple priest usually asks devotees to apply vermilion on the Goddess forehead. Devotees can experience and see this unique feature themselves. Another aspect of this temple that attracts every visitor is the scenic beauty around. Situated in the dense forests with untouched nature, this temple does promise a memorable experience. Seek blessings of the Goddess; bask in the peacefulness of surrounding and the pureness of nature. Saleshwaram Cave Temple is another place to visit. Also known as Sarveswaran or Saleshwaram, it is a hidden natural gem that is worth exploring. Its religious significance and scenic beauty, which remain hidden during most of the year, is sure to leave you mesmerized. Dedicated to Lord Shiva, Saleshwaram Temple has been mentioned in various puranas as well. The ancient Saleshwaram Cave Temple was built around 6th or 7th century AD. Reference of this ancient temple can be seen in ancient Hindu texts such as Sri Parvatha Purana. Celebrated work, Sri Parvatha Purana, which was written in 16th century, in its description of Srisailam, also mention about this cave temple. Mention of two theerthams near the temple, namely Sarvesa theertham and Pushkara theertham have also been mentioned. Another alluring feature of this temple is the mesmerizing waterfall that is located opposite to the temple. With twinkling streams of water flowing down a hill of a height of around 200 meters, surrounded by refreshing greenery creates a hypnotic scenic beauty. An ideal place for adventure lovers, this Saleshwaram is popular for its exciting trekking trails as well. It used to be referred as Longalooty during medieval period. Most of the travelers to Srisailam also visit this place, as it is a home to many ancient temples. Positioned in the midst of rich flora and fauna of a dense forest, Nagalooty is a perfect combination of religious aura, historical and architectural excellence and breathtaking scenic beauty. A historic place, it is the location from where paths to the holy town of Srisailam started. This path to Srisailam from Nagalooty is still used by many devotees. The paths to Srisailam from the southern and the western sides started from Nagalooty. Remarkably constructed steps of stone slabs dating back to 1326-35 A.D, shows that these paths were well developed during the ancient era as well. These paths connected regions of Karnataka state to Srisailam. In Nagalooty, there are many ancient temples that can be visited. Although a few of the sculptures and structures are in dwindling condition, one can easily see glimpses of the glorious past that this place once boasts of. Construction of these temples can be traced back to 13th to 15th century.